Catarata La Paz, in Alajuela Province. 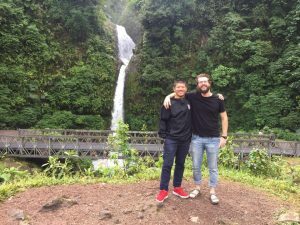 For the first two weeks in January, a group of seventeen students from UW-Madison lead by Claudia Calderón, had the opportunity to study the wonders of tropical horticulture in Costa Rica. They visited coffee, pineapple, banana, palm oil, apple and vegetable farms, underscoring diverse management systems, and the sustainable practices implemented in each farm. They only spent two weeks abroad, but many have already noticed they now have a different approach towards food. They ponder where it comes from? How it was produced? Who produced it? What was the environmental and social costs of this product? Through these purposeful actions, these Badgers are embodying the Wisconsin Experience and highlighting the importance of study abroad programs.